Cottage "E" was known as the "Elkins Cottage," having been built by Senator Davis for his daughter Hallie and her husband, Senator Stephen B. Elkins, of New Mexico, for whom the city of Elkins, West Virginia was named. No. 1 Cottage was built by the Messrs. Walsh as a summer residence for President Robert Garrett of the Baltimore and Ohio, but Mr. Garrett chose the seashore instead of the mountains for his summer vacations and never occupied this roomy and well planned cottage. It was rented instead to Mr. W. W. Corcoran, the Washington banker who years before had been a guest of Senator Davis at his Deer Park home. 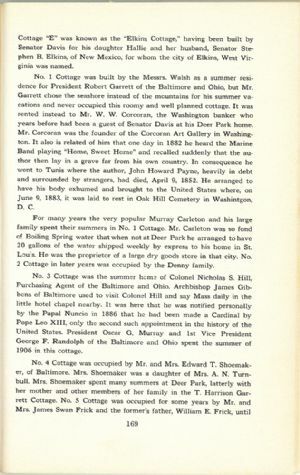 Mr. Corcoran was the founder of the Corcoran Art Gallery in Washington. It also is related of him that one day in 1882 he heard the Marine Band playing "Home, Sweet Home" and recalled suddenly that the author then lay in a grave far from his own country. In consequence he went to Tunis where the author, John Howard Payne, heavily in debt and surrounded by strangers, had died, April 9, 1852. He arranged to have his body exhumed and brought to the United States where, on June 9, 1883, it was laid to rest in Oak Hill Cemetery in Washington, D. C.
For many years the very popular Murray Carleton and his large family spent their summers in No. 1 Cottage. Mr. Carleton was so fond of Boiling Spring water that when not at Deer Park he arranged to have 20 gallons of the water shipped weekly by express to his home in St. Louis. He was the proprietor of a large dry goods store in that city. No. 2 Cottage in later years was occupied by the Denny family. No. 3 Cottage was the summer home of Colonel Nicholas S. Hill, Purchasing Agent of the Baltimore and Ohio. Archbishop James Gibbons of Baltimore used to visit Colonel Hill and say Mass daily in the little hotel chapel nearby. It was here that he was notified personally by the Papal Nuncio in 1886 that he had been made a Cardinal by Pope Leo XIII, only the second such appointment in the history of the United States. President Oscar G. Murray and 1st Vice President George F. Randolph of the Baltimore and Ohio spent the summer of 1906 in this cottage.